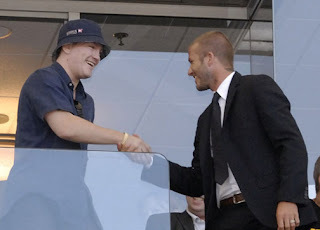 WWW.TIESPLANET.COM - The Blog: Ricky Hatton or David Beckham? OK, I think we all know which one would win in a fight, but who looks the smartest here? There won't be a poll on this one. The British sporting icons were meeting at the Los Angeles Galaxy vs. Houston Dynamo game on Sunday, September 16, 2007 at the Home Depot Center in Carson, California. Hatton is in town promoting his upcoming superfight against Floyd Mayweather. *Photo courtesy of Golden Boy Promotions Inc.